Can't attend? Follow Stewords Riverboat to know of future events! Taste over 50 wines over a series of 10 'voyages', as we explore the famous and the up-and-coming wine regions of the world! 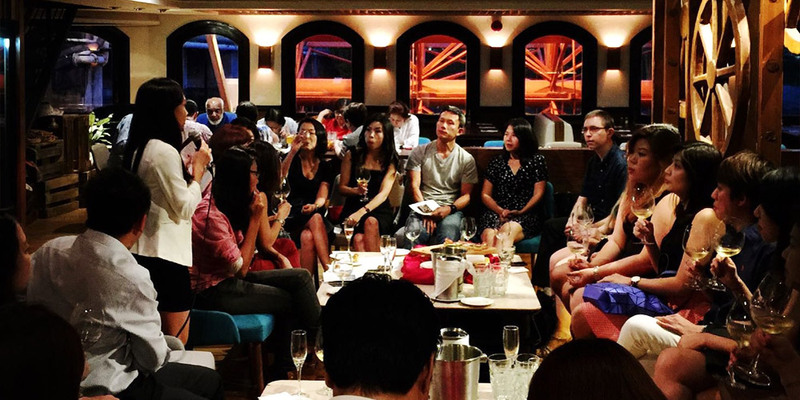 Now in its third season, the Riverboat's Wine Voyages gives you the opportunity to learn more about wine whilst enjoying it with friends in a fun and social atmosphere on board Singapore's very own floating F&B and lifestyle venue. Begin with a welcome sparkling wine and tostada chips. Once everyone is settled in, listen to a short presentation on the day's featured country/region by our guest wine specialist Akimi Yeo, followed by a guided tasting sequence of 4-5 other wines. Feel free to share your thoughts along the way, and ask questions anytime along the journey. Taste five amazing Austrian wines, including their signature Zweigelt which is a cross between two local grapes. Austria as a wine-producing country has come a long way since its infamous 1985 scandal, and its reputation is steadily on the rise as a producer of good, affordable wines. Fresh nose with aromas of apple, citrus, peach, pineapple and some floral notes. Still fresh and fruity on the palate, well-structured and balanced, elegant wine with a long interesting finish. Pale yellow colour with delicate green hues. The nose expresses aromas of green pepper, white pepper, gooseberry and sweet lemon marmalade. Spicy, fruity palate with pleasant silkiness and finish. Shiny ruby red colour with a light violet tone. The nose gives off fruitiness with hints of cherries along with spicy nuances. Its full body with delicate notes make this wine a popular food companion. Hints of red and black cherry are joined by darker notions of black berries. The palate seems tinged with black elderberry and iron oxide with a central vein of acidity. There is structure, the slightest tannin grip plus lots of elegance and poise. This Veltliner, from a basin vineyard site, is full of flavour and concentration: physalis and mango are just some of the enticing flavours; also light tobacco comes through. This wine is rich and supple with fine fruit sweetness. Nice grip on the palate and a light touch of bitter tannins on the finish. For more information, please email events@riverboat.com.sg or contact our in-house wine specialist Daryl Saw at 62785775. See you on board!